INDEPENDENT record label Symphonic Architect will be releasing a brand new music concept album to commemorate the 100th anniversary of the First World War. All the proceeds will be donated to Walking With The Wounded, a UK charity that helps retrain and re-educate wounded service personnel and supports them into careers outside the military. The album is titled Inconnu, French for Unknown, which is the single word engraved on thousands of gravestones in the many military cemeteries found in France and Belgium. They are a lasting tribute to the men of the allied forces who gave their lives fighting in the First World War. A mixture of lyrics, instrumental music and dialogues, the story unfolds as the protagonist reads her grandmother’s diaries written nearly a hundred years ago. Those written words tell of a love story tainted by the heartbreak and horror of a war to end all wars. The main character’s own grandson is fighting a modern war in the Middle East. This shows how conflict has affected three generations of the same family, from WWI up to the present day. The cast of celebrities includes narrator John Nettles (Bergerac, Midsomer Murders), Mark Benton (Waterloo Road, Strictly Come Dancing 2013, Hairspray UK Tour), West End artists Annalene Beechey (Les Miserablés, Phantom of the Opera, Wicked) and David O’Mahony (The Bodyguard), soprano and Classical BRIT nominee Camilla Kerslake and vocal group and Classical BRIT winners Blake. 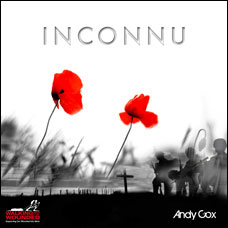 Inconnu will be released to coincide with the centenary of the First World War and will be available primarily as a digital download. However, 500 limited edition double albums will also be produced. For a small contribution (£25), the project can be supported by way of the Inconnu Roll of Honour, which provides an opportunity to remember an ancestor or friend from a past conflict, to honour someone wounded in service or to show respect for someone currently serving in our Armed Forces. Names can be added by visiting www.inconnu.co.uk/roh and filling out a simple online form about the person concerned, which includes the option for a tribute message. The Roll of Honour is limited to 200 names only. It will be listed in the digital and physical booklets of the album, displayed on the project website and will also be narrated as a final track on the album, preserving the names forever.